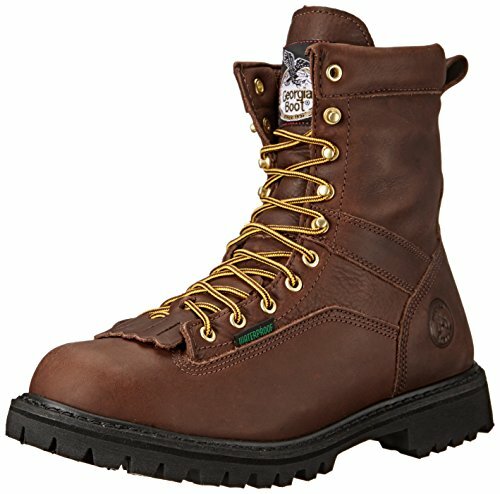 Georgia Boot® lace-to-toe waterproof work boots are tough, quality boots that perform. Your feet are guaranteed to stay dry if you're wearing these boots thanks to the Georgia waterproof system. Go where the job takes you; Georgia Boot has you covered. Lace-to-toe boots are long-lasting with goodyear® welt construction and solid hardware that will stand up to years of lacing. These boots are built with premium leathers so they break in quickly. Comfort features include a removable polyurethane footbed and a steel shank that gives you arch support and stability. The boots have a removable brush guard kiltie. Choose waterproof work boots built with premium leathers. Order Georgia lace-to-toe work boots.